ProSolutions™ Metal Processing is a Calgary based firm, providing finishing and corrosion protective solutions to a diverse clientele throughout Western Canada. Family owned and operated, ProSolutions is founded on principles of honesty and respect. We are committed to providing the highest quality services and products. We know that the joy of reasonable pricing is quickly forgotten by the sting of poor quality. ProSolutions is committed to providing our clients with both quality and competitive pricing. Please fill in the form below if you have any questions or would like to request a quote. ProSolutions has the capability to meet all your pickling and passivation needs. We can pickle any part that can be transported to our facility. If the part can’t be shipped, our on-site crew and capabilities allow us to process parts outside our facility. Our Passivation and Pickling services include the following main processes: Stainless steel pickling, stainless steel passivation, and carbon steel pickling. Stainless steel can corrode in service if there is contamination of the surface. Both pickling and passivation are chemical treatments applied to the surface of stainless steel to remove contaminants and assist in the formation of a continuous chromium-oxide, passive film. Pickling and passivation are both acid treatments and neither will remove grease or oil. If the fabrication is dirty, it may be necessary to use a detergent or alkaline clean before pickling or passivation. Procedures incorporating pickling solutions of nitric (HNO3) and hydrofluoric (HF) acids remove the scale and the underlying chromium depleted layer and restore the corrosion resistance. Pickling solutions also remove contaminants such as ferrous and ferric oxide particles. Pickling solutions other than mixtures of nitric and hydrofluoric acids exist and can be used for specialized applications.Pickling pastes, where the solution is mixed with an inert carrier, are commonly used to treat selected areas such as welds. Pickling involves metal removal and a change or dulling in the visual brightness of the metal.Electropolishing is a useful alternative to pickling. Metal removal is achieved, but usually results in a bright, smooth and more highly corrosion resistant finish. 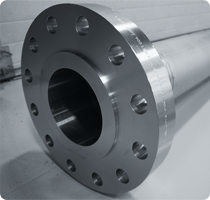 Passivation is the treatment of the surface of stainless steels, often with acid solutions (or pastes), to remove contaminants and promote the formation of the passive film on a freshly created surface (eg through grinding, machining or mechanical damage). Both pickling and passivation solutions can employ dangerous acids that can damage both the operator and the environment if not handled correctly. Stainless pickling acids are highly corrosive to carbon steel.It is essential that all acids are thoroughly removed by rinsing the component after completing the process. Residual hydrofluoric acid will initiate pitting corrosion.It may be advantageous to neutralise the acid with an alkali before the rinsing step. ASTM A380 Standard Practice for Cleaning, Descaling and Passivation of Stainless Steel Parts, Equipment and Systems is a valuable source of information on pickling and passivation treatments. The corrosion resistance of the stainless steel is affected by the roughness of the surface after polishing, with a marked decrease of the corrosion resistance as the surface roughness increases above a Ra value of about 0.5 micrometres. This roughly corresponds to the surface produced by grinding with 320 grit abrasives.Either passivation or electropolishing can be used to improve the corrosion resistance of mechanically polished surfaces. Before pickling, grease, oil, organic contaminants and protective coatings must be removed by means of a water-based alkaline product. To remove oxide layers, annealing skin, mill scale, and corrosion products, the material is pickled with inhibited hydrochloric acid. The pickling time depends on the nature and thickness of the contamination. After pickling, the material is internally and externally flushed with a high pressure power washer and neutralizing solutions. ProSolutions offers powder coating and painting as finishing services for commercial and industrial equipment. 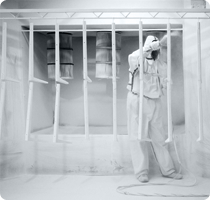 Our powder coating and painting are done at the highest level of quality, for professional finishes. This process involves first cleaning and preparing the equipment. Our experts determine what method of cleaning is required. Once the cleaning is completed, a powder coating will be expertly applied according to the client’s specifications. The product is then cured in our curing oven. The maximum size available for curing is 10.5’ x 10.5’ x 25’. Powder coating is a dry finishing process that has become extremely popular since its introduction in North America over 40 years ago. Representing over 15% of the total industrial finishing market, powder is used on a wide array of products. More and more companies specify powder coatings for a high-quality, durable finish, allowing for maximized production, improved efficiencies, and simplified environmental compliance. Used as functional (protective) and decorative finishes, powder coatings are available in an almost limitless range of colors and textures, and technological advancements have resulted in excellent performance properties. Powder coating is a high-quality finish found on thousands of products you come in contact with each day. Powder coating protects the roughest, toughest machinery as well as the household items you depend on daily. It provides a more durable finish than liquid paints can offer, while still providing an attractive finish. Powder coated products are more resistant to diminished coating quality as a result of impact, moisture, chemicals, utraviolet light, and other extreme weather conditions. In turn, this reduces the risk of scratches, chipping, abrasions, corrosion, fading, and other wear issues. ProSolutions provides industrial equipment painting. Our painting services include in-house surface preparations and painting of various industrial finishes. ProSolutions provides steel shot blasting services in our 30’ x 14’ x 14’ fully-enclosed booth, as part of our equipment preparation services. 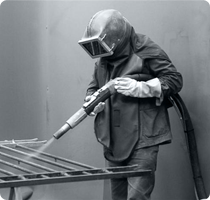 Steel shot blasting is used as a means of cleaning, strengthening, or polishing metal. It is a cost-effective, environmentally friendly method of preparing equipment for final finishing processes. ProSolutions is the Zerust® Sales and Distribution Centre for Western Canada. We support the service and sales of corrosion-inhibiting Zerust® Outdoor Preservation VCI Shrink Film. Zerust® Outdoor Preservation VCI Shrink Film provides advanced protection to metals with Zerust Vapor Corrosion Inhibitor (VCI) technology. This is a premium high-strength 8 mil, high-performance shrink film with UV stabilizers for 3-year outdoor protection. The film shrinks and conforms to objects when heated to repel moisture and contaminants. Zerust VCI saturates the interior of the packaging to protect hard-to-reach spaces and voids from corrosion. This specially designed VCI shrink film is ideal for lay-up and mothballing of equipment and vehicles, as well as outdoor storage of components. Multiple sheets can be shrunk together for any size application such as structures and machinery. Zerust Outdoor Preservation Film protects valuable metal assets and makes them ready to use whenever they are needed. 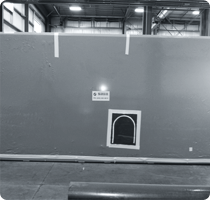 With the use of the Zerust products within our shrink-wrapped enclosures, we can ensure that your equipment is safe from corrosion for years to come, and that if shipped over sea or land, it will arrive in the same condition in which it was shipped. For a complete list of Zerust products, please visit their website at http://zerust.com/, or contact ProSolutions at 403-923-3303.